opinion that the ride had just been a warmup. but not serious -- reservations. It wasnt my craft, though. Check with Mike, I said. Yes! he responded, and went in search of our host. vehicle over and through the waves, in his glory. he was carefully avoiding as they passed by. That part of my brain was seeking a solitude. Solitude. Thats what was missing. Solitude ... peace and quiet. Everything out there was so loud. My thoughts turned inward, turned backward, swam against the tide of noise. something that was quiet ... that offered solitude. A vessel of another kind. No engine, no jets, no noise to speak of. An inherent beauty in its silence. the times in which I lived, the world in which I moved. I remember a couple of days when the thermometer hit 122. We couldnt move. It hurt too much. waiting, as my brother and I were, for a breeze. For days it didnt come. but by a horrible accident. boat capsized and he went underwater. had police on the scene, and scuba divers were searching for the poor fellow. shoreline, watching, waiting, fascinated and full of dread. Then ... a diver popped up and motioned to the deputies in the boat. lifeless body of the priest up and into the patrol boat. and turned in the direction of the boys camp. pondering the vicissitudes of life ... and wondering. my brother -- two years my senior -- the proverbial eye. really), but just couldnt manage it. rose, walked to the water, strode in and swam out to help her. people will go in pursuit of something or somebody. something disapproving in my eyes, stuck out her tongue at me. I never did learn to like her, nor she me. Not through all their months together. The idea first arose at a college party with a little too much beer. my friends were into any drugs beyond alcohol. But the image somehow retains a marijuana-like haze. Probably, if my friends and I had pursued our idea, it would have ended badly. awry with Vietnam and the draft. It was so ... innocent. absolutely no encouragement for those oil-rich sheiks or those filthy-rich oil companies. misguided elders were creating with Vietman and materialism. We will, of course, need jobs of some kind, I said. Michiganian of imposing intellectual powers. When he spoke, I tended to listen. the dock. Too close might give Dad a chance to wave him in. Of course, a dream beyond ones means is all sweat, and generally quite impossible. That was the case with the grand plan to sail the world. We kept sporadic contact afterward, but the dream died aborning. me with something of the feel -- the sense -- of how it used to be. womans mating call, and of dreams leading nowhere. Can I stay out a little longer? he asked. attainable country cousins -- goals -- have to. myself, even at $5,000 or so. Maybe it was a worthwhile goal. Maybe David could work on her, too. Florida -- about a loan. She likes the water, I told myself. After all ... I never had hit her up for the 40-foot sailboat. A former resident of the Odessa area, Betty Appleton -- now of Australia -- recalls life years ago off Steam Mill Road, outside the village. Features. Back in May 2000, Watkins Glen was visited by a Senate hopeful just weeks after his opponent, the First Lady of America, campaigned among us. 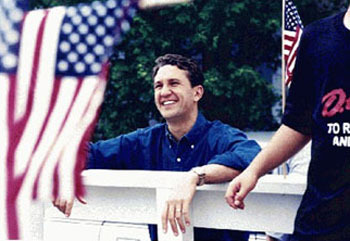 Here is an essay started then and presented now -- about Rick Lazio and Hillary Clinton in Schuyler. Features. One of our area residents, Bob Brown of Montour Falls, provides a lovely essay on a traditional walk and a traditional wave. See Wave. When you hit the road for vacation, you aren't always assured of smooth sailing. Herewith a tale of terror on the highway -- as it really happened. Features.